Home Security-What is required of you? You’ve just had a licensed professional install a brand new, custom, comprehensive home security system. All devices are functioning properly and you’re feeling safer already. What now? Is there anything you need to do? What is expected of you to maintain your system? In all honesty, not much. However, we live in an imperfect world, and no system is completely maintenance free. Think about it, security devices (wireless or not) including cameras, motion detectors, smoke detectors, and sensors all require some form of energy in order to communicate with the central control panel in your home. So what does that mean for you? In most cases it means the purchase and replacement of batteries. Who is responsible for purchasing replacement parts, installing them, and inspecting the devices? 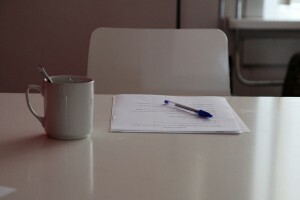 During the process of researching a security company, you probably came across service contract agreements. Service contracts spell out who is responsible for what, and the associated cost/s. The length of the contract depends on the company, industry standard tends to be somewhere around 36 months. Some companies do offer a month to month service with no contract. It is important, as the consumer, to understand the terms of your service agreement and warranty as it will outline what is covered by your security systems provider, and where your responsibilities lie. Be sure to get a written copy of your agreement, it’s a good reference and it will help with any disputes. Here at Perfect Connections, Inc. we believe the typical industry standard 90 day warranty is not fair. That’s why we offer our clients in Northern and Central New Jersey replacement of any damaged equipment (with minor exceptions) for up to an entire year, at no cost to you. Unlike other security systems companies, we also offer a 30 day money back guarantee. Like you, we expect quality products and service to deliver value, not headaches. We pride ourselves on delivering top notch customer satisfaction. Am I charged for false alarms? What, if any, are the fees for service calls? How long is my contract/agreement valid? What happens if I move before the contract/agreement expiration? What is covered under my contract/agreement? Is there 24 hour customer service? Who will be entering my home for repairs/maintenance? 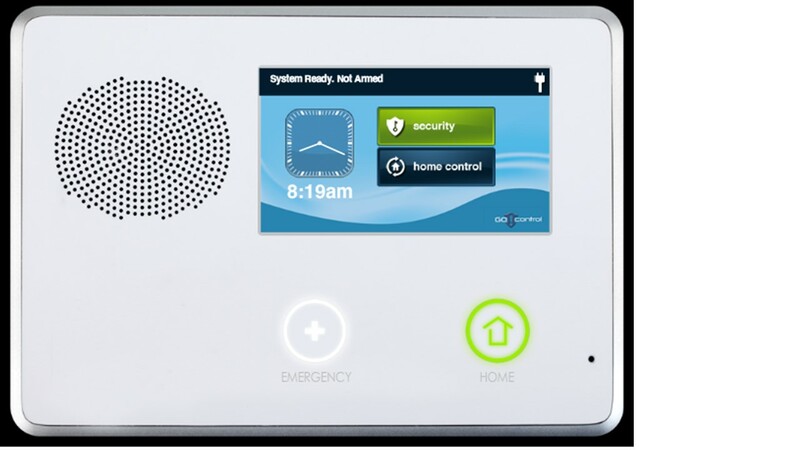 As a security system owner you really don’t need to worry about the functionality of your new devices on a daily basis, custom home security systems are designed to last. After the initial installation your system should run smoothly for a long time. As previously mentioned, you might have to replace batteries every now and then, and there may be periodic software updates. Devices that typically require batteries include motion detectors, smoke detectors, carbon monoxide detectors, door and window sensors, and cameras. If you’re not comfortable, or unsure of, the type needed for your devices you can always call upon your security system provider, and they can give you that information or replace them for you. Be aware there might be a cost associated with a service call, but ultimately that cost is nothing compared to what it would be to replace devices damaged by improper maintenance. Aside from the occasional battery replacement, what else might you want to check on? Performing operational tests to make sure everything is running correctly is a good idea. Your central control panel should have some sort of alarm test section/button. Before running a test on your system, you should alert your monitoring service to prevent a false alarm. Requesting annual inspections performed by a professional will help with the upkeep and functionality of your system. Some companies even offer annual inspections as part of their service agreement/contract. 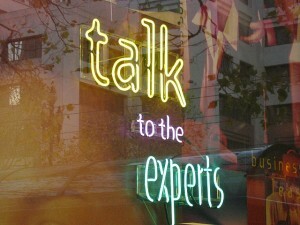 If you have any questions or are unsure of how to maintain or check your security system, always call a professional. This will help avoid accidentally setting off false alarms or damaging equipment. Some general security maintenance tips to keep in mind are to make sure your sensors and detectors are clear of cobwebs and obstructions that may cause false alarms. Occasionally check that your lighting, interior and exterior, is working properly as it can be a powerful crime deterrent. Periodically taking a quick stroll around the perimeter of your home will help assure everything is in order, and add to your peace of mind. 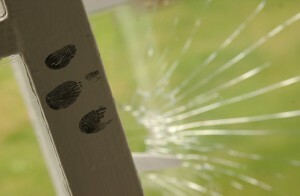 It couldn’t hurt to occasionally check for general wear and tear, or damage, to your security devices. Think of your home as a kit of parts, everything must be put together and maintained properly in order for it to function optimally. You wouldn’t let a leaky faucet go unrepaired for the fear of flooding, your security system is the same. If you notice something that doesn’t seem right, contact an expert, they will save you time, money, and aggravation. Your home is the physical structure that protects your family and possessions from the elements, your security system is a partially invisible shield that helps prevent all sorts of potential catastrophes. Keep it running smoothly. While you can perform some of the basic upkeep of a security system yourself, is it always wise to inform or include your security systems professional if it is unclear what needs to be done. At Perfect Connections, Inc. we put customers first. Our specialists are knowledgeable about the devices they install, and understand the complexities of a comprehensive security system. 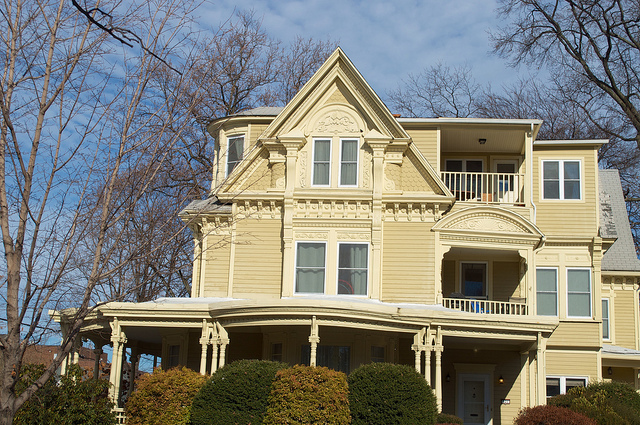 Our team has been providing expert service in Northern and Central New Jersey since 1992. With decades of experience you can be sure Perfect Connections, Inc. understands what matters most and will provide superior home security service. What is a security system? This may seem like a silly question, but no two security systems professionals will give you identical answers. Here at Perfect Connections, Inc. we have spent decades defining what a security system is and how it changes people’s lives. Our team has been providing expert service to Northern and Central New Jersey businesses and homes since 1992. When it comes to security systems we believe there are key components, when combined, create a comprehensive system that will provide unbeatable protection for your business or home. Burglar alarms, access control, surveillance systems, and fire alarms are the major umbrella of ingredients for a comprehensive security system solution. Sounds good, right? What does it all mean? By examining how these different security features work together, and how they are applied in different situations, you will gain a better understanding of what a “comprehensive” security system is. 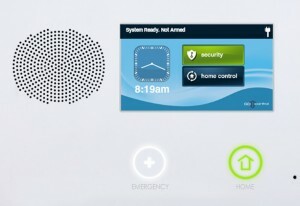 How do you define what a security system is? Let’s break it down. 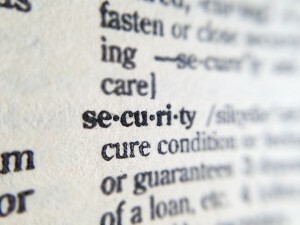 According to Dictionary.com, the word “security” can be loosely defined as freedom from care, risk, anxiety, danger, or something that makes you feel safe. A “system” is described as, “an assemblage or combination of things or parts forming a complex or unitary whole.” Combine the two and you have an assemblage of parts that provide freedom from danger and make you feel safe. That’s exactly what the end goal of installing a security system is. Its making you feel safe, knowing you’re protected, and obtaining a peace of mind you can’t get from anything else. While the combination of security features used in commercial and home applications are similar, they are not exactly the same. Nor should they be, a home is nothing like an office building, scrap yard, manufacturing or healthcare facility. There are different requirements and fire safety codes and standards for each, and they are dependent on the state and area you reside or run a business in. You security systems professional should know which rules apply to your specific situation. Rules aside, let’s discover the similarities/differences between residential and business security systems. Access control, burglar alarms, surveillance systems, fire alarms, and carbon monoxide detectors are like the bread and butter of a comprehensive security system. In a residence, access control could mean entering a personal code on a key/touch pad in order to gain entry to your home. In some cases it could mean using a fingerprint to deactivate a lock. Door and window sensors can act as another layer of access control. For example, if someone were to break a window or kick open a door, the sensors would be activated and so would the alarm. This would help fend off the potential threat and prevent full access to your home. Depending on your business facility you might have similar features. A main difference between your home and your business is you likely have employees. Having employees could mean limiting access to different areas of your building/facility, dependent on an individual’s clearance level. In this case you might issue swipe cards or key fobs that would communicate with a reader at an entry way. These types of controls help limit who can enter, and sometimes exit, specific areas of your facility. Surveillance equipment that is tied into your security system is a great crime deterrent, especially when visible or known to outsiders. It can help you and the local authorities catch criminals in action. Having cameras throughout your residence not only helps you feel more protected, but it can provide remote access to your home when you can’t be there. By using a mobile device and the Alarm.com app, you can communicate with your security cameras from virtually anywhere. This holds true for commercial applications as well; a major difference being a larger coverage area and camera size. Don’t worry, the size of a camera is not indicative of its quality- bigger isn’t always better. Your security systems professional will have better insight as to the type, size, and quantity of cameras to install at your home or business. Having cameras throughout your building/facility will also help decrease the chances of employee theft. Having the proper fire alarms, carbon monoxide (CO), and smoke detectors in both a residential and business setting is not only a good idea, it’s required by state and local laws/codes. How does this tie into a comprehensive security solution? When deciding on features for your security system, you can opt to have fire alarms and CO detectors communicate with your central monitoring panel and your alarm monitoring service. This helps immediately alert police, fire stations, and ambulance at initial detection, preventing potentially life threating situations. What good is a CO detector or fire alarm if it’s beeping and no one is around to hear it? That’s where alarm monitoring services come into play. Having an alarm monitoring service means you and emergency responders will be notified of disturbances at your home or business, even if you’re not there. Whether you are considering a residential or business security system for the first time, or want to explore your options, do not hesitate to contact our team at Perfect Connections, Inc.. We have been providing home and business security system solutions to Northern and Central New Jersey for 22 years. We’re here to help you protect what matters most. We live in a fast paced society, everyone is constantly on the move. This effects every aspect of our lives including the family dynamic. The stereotypical roles of male worker and female caregiver have significantly shifted in light of economic growth, expansion of civil rights, and the need for dual income. In fact, women today constitute 47%, nearly half, the total workforce in the United States. As both parents enter the workforce, who will care for their children? Those who are lucky have family or close friends that help provide care, but in most cases parents rely on daycare or childcare facilities. Parents entrust the lives of their children to licensed caretakers throughout the day to watch over and protect them so they can earn a living to support the family. Childcare and daycare facilities have become a home away from home for an increasing number of infants, toddlers, and young children. This begs the question, what is being done to ensure their safety at these facilities? As a daycare facility owner/operator, you know there are certain state laws and licensures you must adhere to. However, the law cannot provide protection from the unpredictable external/internal dangers at a facility. How do you prevent total strangers from entering your facility? How are the local authorities contacted in case of emergency? How can you keep an eye on what is happening throughout your facility? These questions are a concern not only for facility owners but parents as well. There are proactive steps you can take to safeguard the children you care for and your facility. Installing a comprehensive security system that includes alarm monitoring, video surveillance, and access control will significantly decrease the chances of a potential disaster and provide peace of mind to you and your clients. Like any other business, you should have a security assessment conducted to find out where your weaknesses are and how to address them. 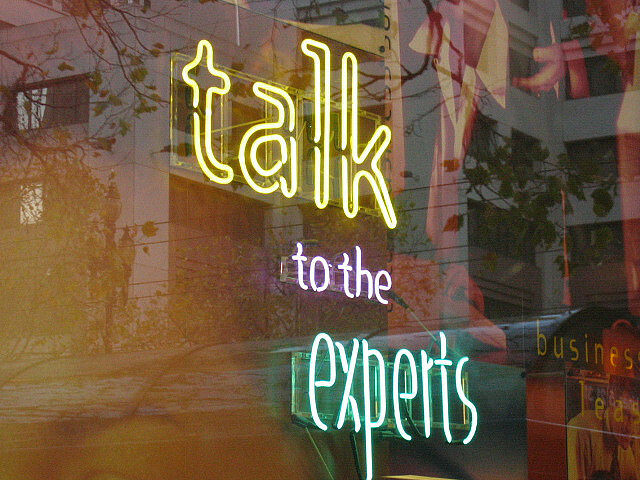 Let the experts at Perfect Connections, Inc. help you safeguard your business and the little ones you care for. As industry professionals, we have been providing business security systems services to Northern and Central New Jersey for the past 22 years. While you maintain a reputable care facility for your clients, you cannot deny the potential threats to the security of your business. Keeping intruders and deviants out is a top priority. This may sound obvious, but without proper access control a door is just a door, and that alone will not necessarily stop an intruder. It’s not only access control you have to be cognizant of, but fire safety and code compliance, child abduction, employee behavior, and emergency planning, all while keeping track of the kids. Daycare and childcare facilities are typically not required to have a security system, however, the benefits of installing one far outweigh the cost. Unlike material objects, children are irreplaceable. They are the link to our world’s future, shouldn’t they be the most protected? Of course! You’re probably thinking about all the reasons you don’t need a security system, like your business is in a safe area nothing could happen; or you always lock the entry once all the children have arrived, you even have the required smoke and carbon monoxide detectors. Well, what about who is watching the hallways? How are police and emergency responders notified? What about other access points? 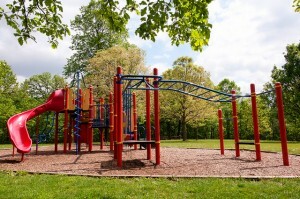 How is the playground protected and monitored? How do you know your employees are actually paying attention? These are the types of questions/concerns parents will have, or at least be thinking about when they are looking for a facility to care for their child. What can you do? As no two facilities will be the same, no two security solutions will be the same. Have a licensed professional assess the current state of your facility, and consider installing a comprehensive customized security system. No system is perfect, but having one will help deter potential threats, help you manage the day to day of your business, provide peace of mind to you and your clients, and enhance whatever security features you may already have in place (like fencing). By having some sort of access control, whether it’s a password activated keypad, key fob, or card reader, unwanted or unauthorized visitors will be denied entry creating a more secure barrier. 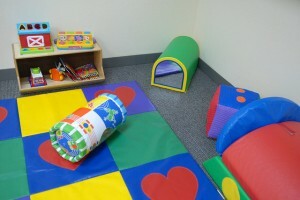 Some daycare centers have implemented biometrics as their means of building access, like at Playhouse Child Care Center in Minnesota. Registered parents must use their fingerprints to gain entry and pick up their child. Surveillance equipment is useful as it can help monitor specific areas within and outside your facility. Obviously, cameras in the bathroom are not allowed, nor should they be, but having them in hallways, playrooms, at the entries/exits, and overseeing the parking lot and playground/outdoor play area will give you a better grasp on what people are doing and where/when they are doing it. If an incident were to occur you would be able to utilize recorded footage to review the details of a specific event. Recorded footage can be particularly useful to police and investigators. Including a monitored alarm system that communicates with sensors and/or detectors, will immediately alert the local authorities of an emergency, allowing a quicker response time. All security features are preventative, while they’re not 100% perfect, they will decrease the chances of disaster. Whether you are considering a security system for the first time, or think it’s time for an upgrade, be sure to contact a licensed security professional to perform an initial assessment in person. Our team of experts at Perfect Connections, Inc. will help guide you through the whole process, from initial assessment to final installation. If your facility is located in Northern or Central New Jersey, do not hesitate to contact us. Custom business security systems are our specialty and we have been providing service for decades. While to the average person, a salvage or recycling facility may not seem like a susceptible business, owners know there are considerable threats to its security. In the United States and internationally, as the economy fluctuates, creating high highs and low lows, raw materials, especially metals, maintain a certain value. 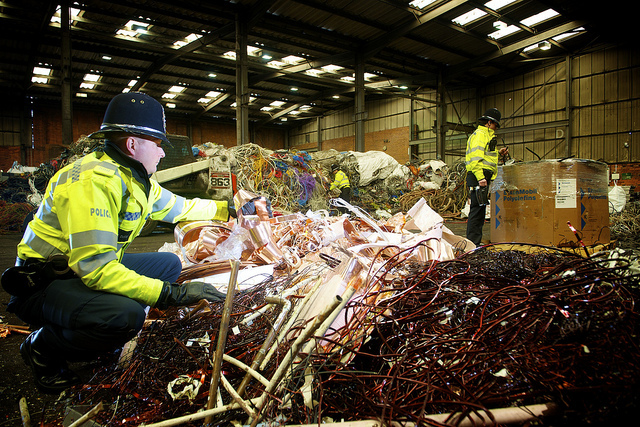 Scrap metals are actively sought after as they are continuously recycled and reused. According to the Bureau of International Recycling they are frequently added to new metal production. What are the security issues surrounding salvage and recycling facilities, and why are they a prime target for theft? For one, they typically house valuable metals such as copper, aluminum, platinum, bronze, zinc, nickel, and catalytic converters which are full of precious metals like palladium and rhodium. Depending on the market value, which is fluctuating daily, such items can fetch a pretty penny. Many salvage yards and recycling facilities can be, if not fully, partially exposed to the outdoors, making them more susceptible to criminal activity. Another problem these facility’s owners/buyers face is when customers attempt to sell material, it’s hard to tell if that person is actually who they say they are, and if the items they are trying to sell are stolen or not. Never mind the legal implications that come with buying stolen material, your company’s reputation could be at risk if the public believes you’re aiding criminal activity, whether it’s by accident or ignorance. 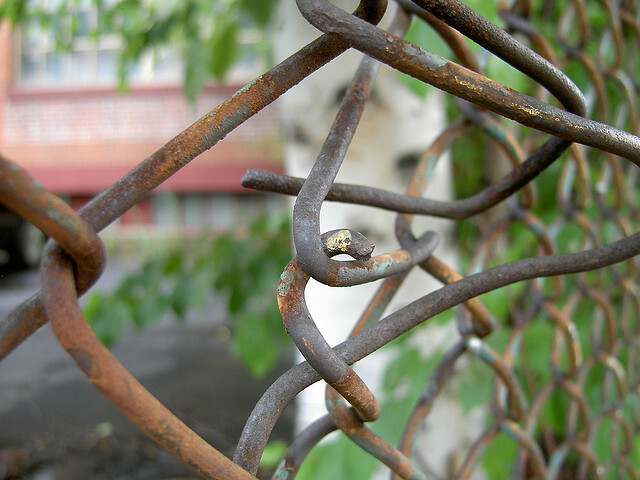 The damages incurred by metal theft can be extremely costly as well. Cases of metal theft in the United States costs businesses an estimated $1 billion annually, according to the U.S. Department of Energy. Stolen metals/scraps is not only an issue for the buyers, it causes all sorts of trouble for the sources of the stolen items. When thieves steal they’re not only stealing from other scrap or salvage facilities, they hijack material from personal cars, railroad tracks, public transit, abandoned or unprotected homes, warehouses, construction sites, and anywhere else there’s opportunity. They’re not only a danger and nuisance to the public, but themselves as well. According to Earth911.com a man in Arizona was found with burns covering his entire body because he was attempting to steal copper from a transformer. Not only did he hurt himself, he inadvertently cut power to 1,400 customers. While criminal statistics can be broken down into many categories, metal related theft is unfortunately not one covered by the FBI Uniform Crime Report, which is “the most widely used crime database in the country. ” This makes it difficult to get an accurate national reading on this type of crime. However, many states have implemented their own legislation to help deal with and track salvage/recycling facility theft and illegal purchases. As the issue of metal theft has become more prominent, stricter state legislation has been and will continue to be implemented. Partnering with the local authorities and reporting crimes or suspicious activity/behavior are crucial components in decreasing salvage/recycling facility crime rates. While laws and regulations can help significantly, there are always people who are willing to break or bend the rules, which is why it’s advantageous to reinforce your facility with a comprehensive security system. Being a salvage/recycling facility owner you may already know that there are different state requirements when it comes to the purchase and tracking of metals, and the identification of selling customers. 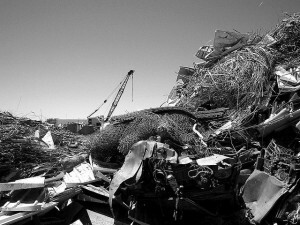 For example, in September 2014 a New Jersey bill was passed stating that scrap metal business are, “to maintain, for at least 18 months, a record of all receipts or purchases of scrap metal, instead of only for those purchases in excess of 100 pounds or $50, as currently provided by law.” The bill also stipulates that payments are to be made by check to that person or their company, mailed to their personal/company address. Cash payments are permissible as long as a photographic record of the seller is maintained. Keeping records of customers will help business owners and police track stolen material and illegitimate individuals. It will also let the seller know you mean business. If you are unsure of your states current rules and regulations you can visit the Institute of Scrap Recycling Industries, Inc. They offer a summarized compilation of state metal theft laws that was last updated on September 30th, 2014. 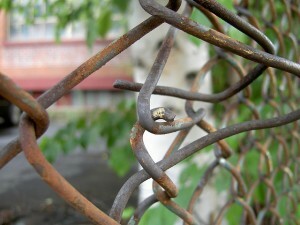 There is also a website geared toward preventing and catching scrap metal theft, it’s called scraptheftalert.com. Becoming a member of this website gives you the advantage of being alerted and alerting others within the industry when an incident has been reported within a 100 miles radius of your location. With stricter laws and law enforcement, salvage and recycling facilities have a better chance of avoiding criminal activity. Nevertheless, people are always willing to break the law, especially if they see easy opportunities. The law won’t prevent someone from climbing over the gates of your facility, it won’t stop someone from trespassing, and it will not stop criminals from seeking out the weaknesses in your facility for easy access. Your best line of defense is installing a comprehensive monitored alarm system that includes surveillance, motion detectors, access control, automatic lights, and a fence. Erecting a fence is your first line of defense as it guards the perimeter of your facility. It’s great until someone cuts through it, climbs it, or digs under it. Maybe you have automatic or motion activated lighting throughout your facility as well. Lighting can be a powerful deterrent, but it may not be enough. If you really want to manage your security it’s imperative to install a monitored surveillance system. Cameras can not only deter a potential threat, but help you and the police catch the perpetrator/s. You can even access footage of activity at your facility remotely from the convenience of your mobile device or home computer. Notifying the public of your camera surveillance through posted signage will help prevent potential crime as well. David Guz, the president of H & H Metals in Michigan owns a 15 acre facility. He was recently interviewed for Recycling Today on how he manages efforts to avoid theft from his sprawling yard. Not only is communicating with local authorities a major factor, but “After 36 years in business, Guz says he has just about seen it all, while the “state-of-the-art” security system he had installed three years ago helps him to really see everything that goes on in his 15-acre yard at any time.” His security system includes surveillance equipment, motion detectors, access control, and monitoring services. Combining all of these security components along with fencing and automatic lights, can significantly decrease catastrophic loss and damage to your business, saving you time, money, and aggravation. Before you dive in to the seemingly endless world of security options, be sure to have a licensed professional assess your security risks in person. If you are located in Northern or Central New Jersey, our team of experts at Perfect Connections, Inc. can help analyze potential weak spots and customize a security system solution that best suits your business’s needs. Don’t wait for tragedy to strike, stay a step ahead of the criminals and protect what you’ve worked tirelessly for. Protecting your business is a top priority. You’ve done your homework, found a security systems professional, and are ready to customize a security system that fits your needs. When browsing the vast array of available security system options you’ve probably come across the phrase access control. What is it, and does your business need it? In general, access control is exactly what it sounds like, it grants, denies, or limits entry and sometimes exit to an environment. To get a little more specific, “Access control systems are physical or electronic systems which are designed to control who has access to a network” (wisegeek.com). One of the most obvious and simplistic examples of access control is a door with a lock and key. Being a business owner, you know it may take more than a door to protect you, your employees, and company assets from potential crime and danger. Including an access control device, whether it’s a proximity card reader, keypad with password, fingerprint scanner, or a combination of these, as part of your comprehensive security system can help prevent costly and disastrous interruptions in your day-to-day business. It can also keep you informed on who is coming and going, where your employees are going throughout the day, limit access to specified areas, and keep unauthorized people out. Security systems companies like Perfect Connections, Inc. can provide a variety of access control solutions to better secure the integrity of your business. 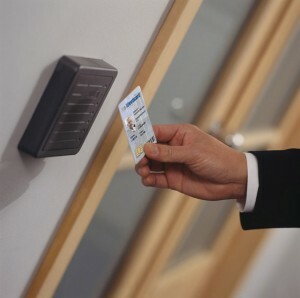 As previously defined access control can consist of physical or electronic systems. Today, many systems are a combination of both. There are a few basic types of access control systems, that when used in conjunction with monitored alarms and surveillance can provide comprehensive protection for your organization. Locks, readers, keypads, cards or fobs, and biometric scanners are some of the most common forms of authentication devices. So what are they, and how do they work? You’re probably aware of the general function and parts in your average door lock. Typically there is a knob or lever that when turned releases the door latch from the strike plate on the wall. Today, there are more advanced locking mechanisms that can provide better protection for your business. Two of the more commonly known locking mechanisms are magnetic, or maglock, and electric strikes. Magnetic consists of an electromagnet and armature plate; it works by a current passing through the magnet attracting the armature plate creating a locked position. Maglocks are a durable and fast acting solution. Electric Strikes either accept alternating or direct currents. Like a standard strike, they accept a locking latch. Unlike a standard strike, they can be configured to open without the use of a lever or knob turn, and are controlled by electrical currents. These types of locks can be triggered by a readers that accept cards, key fobs, or keypads with passcodes, and biometrics. It is important to remember that where you have locking doors, gates etc. egress and fired codes must be taken into account. To be sure your locking mechanisms are code compliant, be sure to have them installed by a security systems professional. According to William Deutsch i n regards to EAC (electronic access control), “In a modern EAC system, the readers are designed to recognize codes (something you know), credentials (something you have), or biometrics (something you are).” Readers take the given information from the potential entrant and either confirm identity by allowing access or deny it for being false or incorrect. They are the means by which information is processed and they can be installed on the exteriors and/or interiors of a facility. There is a range of readers available including proximity readers and smart card reader; hiring a knowledgeable and informative security systems professional like Perfect Connections, Inc. will help you better assess your facility’s needs. You may think the construction of your facility wouldn’t allow for the installation of a reader. For example, if you have a fully glazed entry, where would it go? Luckily, readers can be applied to architectural elements that are as minimal in area as window/door mullions. Don’t let the architecture of your facility dictate your security needs. As with any system, nothing is perfect; if someone were to steal a key fob and hack a PIN, the reader will not know the difference, and the intruder will gain access. This is why having a comprehensive security system that includes surveillance and monitored alarms in conjunction with access control is best. Keypad technology typically consists of a small mounted panel that requires a password, PIN, or code, that when entered correctly, unlocks or grants access to electric or magnetic door locks, gates, and/or security systems. This method of identity validation is simple, economic, keyless, and not uncommon. The benefits of a keypad they can easily be recoded, they can be standalone or tie into central control stations to protect multiple entry points, and they will help deter opportunists. Unfortunately, they are not infallible. Codes, passwords, and PINs can easily be shared, and if there is no protective housing for the keypad, onlookers can easily view a code being entered, or see wear and tear on the buttons or screen that are used most (Dan M. Bowers). Used by themselves can leave a facility susceptible to outsider access, but used in combination with other technologies like card readers, key fobs, and/or biometrics will increase their effectiveness. Combining the keypad with another verification control can be called “two factor authentication,” and it’s more secure than the keypad by itself. Access cards and key fobs also commonly referred to as “credentials,” are a popular security measure for many businesses. Access cards or RFID (Radio Frequency Identification) cards contain specific information that is transmitted to the reader when within a given boundary. Sometimes the cards, which are typically the size of a standard credit card, have to be held to or tapped on the reader, or they can be set up to read the contained information from a specified distance. The same type of information is stored and conveyed by a key fob key fob which is usually molded from plastic or resin, and is small enough to fit on a keychain. 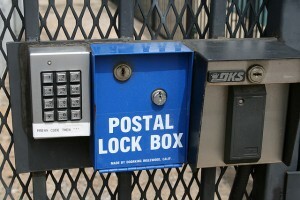 This is a more secure option than the keypad by itself, as the cards and fobs are not easily replicated. However, theft or loss of a card or fob can be problematic. Just as with the keypad, including layers of protection through a comprehensive security system can make all the difference. What is biometrics? “Security Biometric is the science of using physical characteristics (fingerprints, eyes, hands) to identify a person and some of the products used in this system include fingerprint readers and retinal scanners.” While this type of technology may seem a little unconventional when it comes to access control, its presence is becoming more evident. The most common applications being fingerprint readers and hand geometry scanners. The benefits of a biometric system include never forgetting the item that will grant you access because it is part of you, and it’s harder to forge. One of the major drawbacks of a biometric system is the cost. Also, once the data is collected from an individual and stored, it can’t be changed because it so unique. Biometric security is controversial topic for many as it can be perceived as an invasion of privacy. While it may be considered controversial to some, it can provide the necessary means of protection for others. What Are You Doing To Control Access? Whether you’ve been considering controlled access to your facility for a while, have an old system in place, or this is completely new territory for you, don’t wait another minute! Contact a trusted security professional at Perfect Connections, Inc. to help guide you through the process. From an initial assessment to final installation, you can rely on our exceptional team of security experts that has provided service to Northern and Central New Jersey for decades.